The older get, the more I realize I don't want to be around drama, conflict or stress. 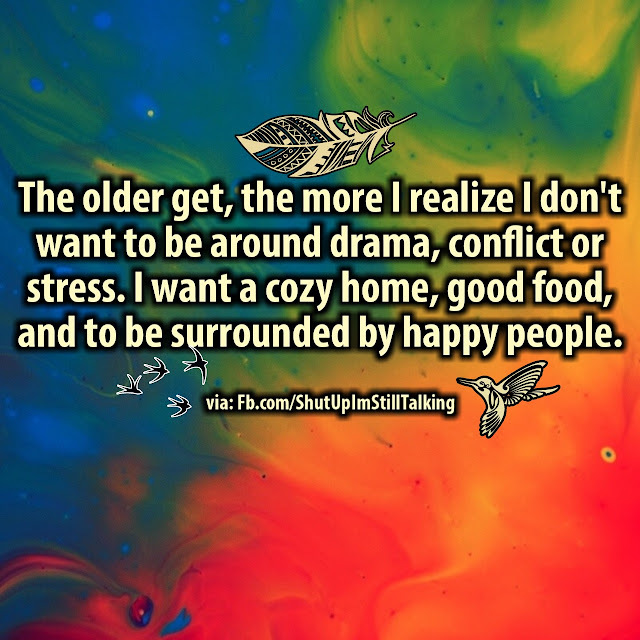 I want a cozy home, good food, and to be surrounded by happy people. In theory but not always possible to achieve, because we are human and should try to help all people not just the happy ones. But shouldn't we also be willing to spend time with negative people. Sometimes not all people can be happy. And need someone willing enough to listen to them. I don't want to be around people living in a positive thinking bubble. It's not realistic. Life is full of problems and if we can't at least listen to someone or offer encouragement then it's pretty sad, The mean unhappy people can cause big problems, though. Willing to spend time with Happy People picture/image is an Inspirational Stuff to Inspire and Motivate You. You can download pics by just clicking on the Images. Thanks for visiting Truth Follower an online place for huge collection of inspiring pictures, quotation, and Sayings Images. If you like Willing to spend time with Happy People, Please Share with friends and family on Facebook, Twitter, and Pinterest.